If you have a costume and you’d like to share it with the world, then go and fill out the submission form. Please include a picture with detailed information for creating your costume. Many kids absolutely love to play the claw machines at shopping malls. And my kids are no exception, they do it often – it is really exciting for them. 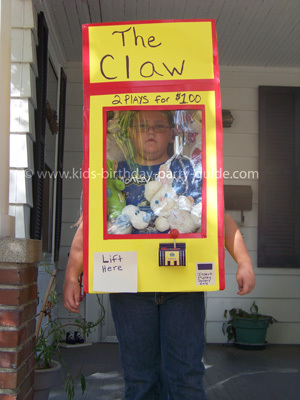 So when I asked my son what he wanted to be this year for Halloween, he said the claw machine. So to make this costume, we took a card board box and cut out a hole in the bottom of the box so he could easily slide it over his head. Here is how you can do that: cut the front, back and sides to look like windows. I covered the box with poster board to add some color for extra visual appeal. I then added some plastic window insulation so it would look like glass. Plus I made a joy stick on the front to look like the controller. Then added the money slot and the shoot where the animals come out of the game if someone wins. I made the claw out of pipe cleaners that are wrapped in aluminum foil. And the aluminum foil is attached to a dal-rod across the top and glued to hold it in place. Once my son was in the box I added the stuffed animals (that we bought for him or he won playing claw crane) from the top which was left open so he could breathe. He had a great time wearing it and received many positive comments and also many people requested to play. If your child likes stuffed animal toys or claw cranes, then I’m sure he or she would love having this costume for the next Halloween or birthday party.